Frank Frederick Bell II (1888 – 1968). 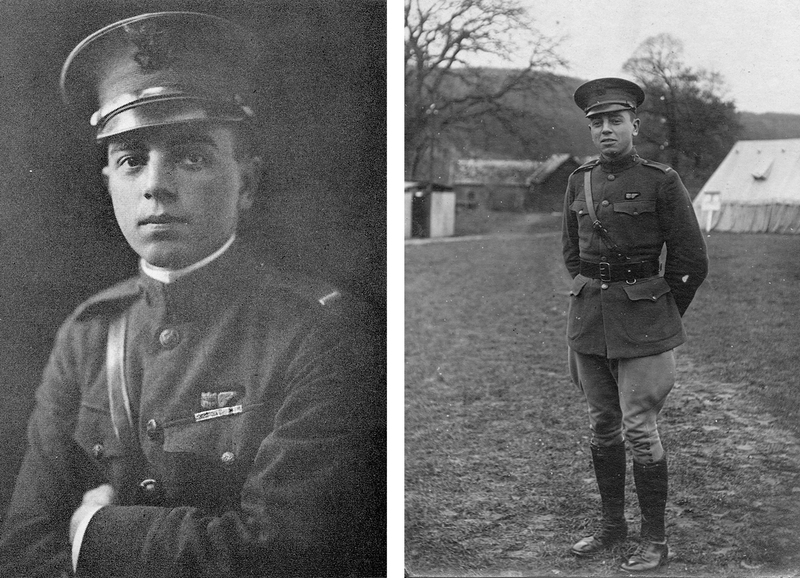 In June 1917 after the United States entered World War I, Frank passed the examinations, was commissioned as First Lieutenant, Signal Reserve Corps, Aviation Section, and was ordered to active duty at Chandler Flying Field in Essington, Pennsylvania, July 20, 1917. From September 1918 to November 1918, because of a cyclone blowing down the field, overseas orders were rescinded. He then helped rebuild the field and performed duties as Assistant Engineering Officer and Instructor in Formation Flying, Gerstner Field, Louisiana; Classification Bombing Pilot. He was honorably discharged January 20, 1919 with rank of Captain, R. M. A. Air Service (Aeronautics), U. S. A.. He did not accept Reserve Commission at this time but later decided to come into the service, so he was commissioned Captain, Corps of Engineers Reserve, U. S. A. January 26, 1923; Captain, Coast Artillery Reserve, 1932; Major C. A. Res. 1932; Lt. Colonel C. A. Res. 1938, during which time he commanded the 972nd Coast Artillery (Anti-Aircraft) Regiment; Inactive Res. August, 1941 to December, 1942 due to physical disability which was corrected. Ordered to extended active duty as Lt. Colonel Corps of Engineers January 2, 1943, reporting to Engineer Unit Training Center, Camp Claiborne, Louisiana. He was promoted to Colonel, Corps of Engineers, AUS April 1, 1944 and returned to inactive status as Colonel Engineer Reserve December 28, 1945. Promoted to Brigadier General, Reserve Corps April 26, 1948, he served two weeks active duty in the rank and retired as Brigadier General, AUS, September 27 that year, having reached the statutory age under Public Law 810. Dudley Edwards Bell (1894 – 1974) entered Plattsburg Training Camp May 8, 1917. 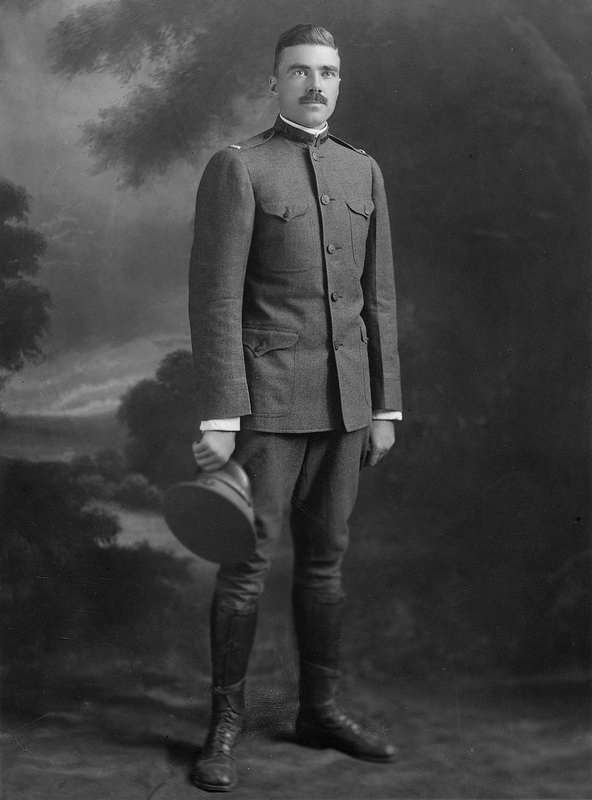 At completion of camp, he applied for Regular Army Commission, but was first commissioned Second Lieutenant in the Officers Reserve Corps, Infantry, August 15, 1917, and then Second Lieutenant, Regular Army Infantry October 26, 1917. The commission had been held up to permit seniority of West Point graduates. Dudley Edwards Bell embarked for overseas on the Meganitc May 10, 1918, arrived at Liverpool, England, and immediately embarked for Calais, France, where he was entrained for Samer, France, and remained with Headquarters 4th Division, U. S. A. for one week, after which he was ordered to 9th Squadron, Royal Air Force, British Expeditionary Forces. Dudley Bell wounded in action. He reported for duty to 9th Squadron and was immediately put on flying duty about June 1, 1918. The Squadron moved to Argenvillers and war flights were made daily and sometimes at night, during which he did active front line work until July 4, 1918. On the morning of July 4 during an attack in that area by the British, Australian and American forces, while acting as observer, his plane was attacked by several German planes while flying near the town of Hamel (near Amiens). They were shot down, falling about 1800 feet, his pilot killed, and Bell was severely wounded by machine gun fire and badly injured from the crash. He was shot in the forehead and dislocated his thigh. He was picked up by American stretcher bearers, attached to the Australian troops, and shipped from battlefield to General Hospital, Rouen, France July 6, 1918. About a week later, he was moved to La Havre where a hospital ship conveyed wounded to Southampton, England. Bell was then transported to McCaul’s Hospital in London, where skillful surgery was applied and as soon as sufficiently recovered, he was sent to Rest Camp at Hursley, England, October 4, 1918. In the meantime, he had been promoted to First Lieutenant, Infantry, U. S. A., June 17, 1917. On November 29, 1918, he was ordered to Port of Re-embarkation in Liverpool and disembarked from the Cedric in New York December 24, 1918, where he was ordered to Camp Mills until honorably discharged February 4, 1919. He held the Purple Heart and World War I Victory Medal with one battle clasp. 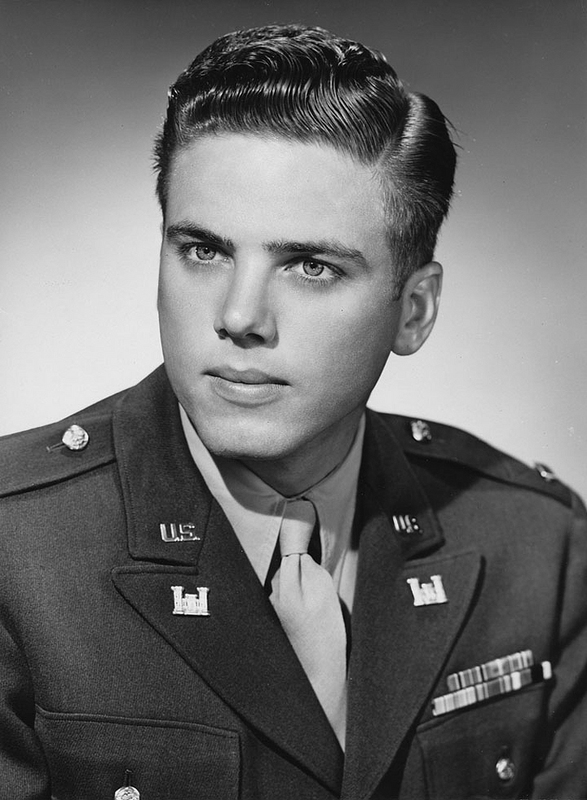 Frank Frederick Bell III (1921 – 1998). In May 1942, during his senior year at the University of Texas, Frank left to join the armed forces and enlisted as Naval Aviation Cadet, reporting to Hensley Field, Dallas, May 21. After completing his primary flying there, he was transferred to U. S. Naval Air Station at Corpus Christi, Texas in August for more advanced training. After the completion of this course, he became a Cadet Lieutenant Junior, and then Senior grade. On February 6, 1943, he was commissioned Second Lieutenant Naval Aviator, U.S. Marine Air Corps, and flew PBY anti-submarine patrol missions in the Gulf of Mexico. After instructing in twin engine flying at Marine Air Station, Cherry Point, North Carolina, he was sent to Instrument Flight Instructors School, Atlanta, Georgia from April 10 to June 10. After completing his course, he became instrument flight instructor at Marine Air Base, Santa Barbara, California, and was promoted to First Lieutenant as of August 1, 1943. From there he went to Marine Air Station, Camp Kearney, San Diego, California, as instructor in multi-engine R4D and R5C planes; thence to Marine Air Station, Corvallis, Oregon to join the newly activated Marine Transport Squadron VMR 953. In April 1944, this squadron flew to its new base at Ewa Field Marine Station, Oahu, T. H..
Having been promoted to Captain August 30, 1944, as first pilot of a C-46 Transport, he participated in the war flight operations of his squadron on the Hawaii-Palmyra-Canton-Funa Futi-Espiritu Santo-Quadalcanal-Russell Island route, and the Canton-Tarawa-Majuro-Kwadjelein, Eniwetok-Guam-Lyete and Johnston Islands-Majuro and French Frigate-Midway routes. During World War II, Frank F. Bell, III held two flying records in a Marine R5C. He held the record for flying a R5C (or a C46, Army) for 15 hours and 40 minutes over the Pacific Ocean. This occurred when he was taking a new plane for his Squadron VMR 953 to Hawaii from San Diego, California. Due to a wrong compass heading given him at take-off, his navigator told Frank that according to star shots they were not on the right course. Frank changed to a no-wind heading for the Hawaiian Islands. He found that they were flying into strong head winds as they were on the wrong side of a low. Leaning the engines, he let down over the water, preparing to ditch as they were long overdue for the estimated time of landing at the Islands. He barely made it to Ewa Field. As he landed, the engines quit – no more fuel. No one believed it could be done. On a flight from Guam to Eniwetok, he lost the port engine at the half-way point, with 500 miles to go. Unable to unload the freight, he was able to hold the plane at 500 feet above water, arriving at Eniwetok in four hours and twenty minutes. This was another record for flying time on a single engine. Flying his plane back to U. S. July 5, 1945, he was placed inactive as Captain, Marine Air Corps Reserve December 2 of that year, and later promoted to Major, Marine Air Corps Reserve. He held the Unit Presidential Citation Ribbon for participating in record flights of Squadron VMR 953; and the Asiatic Pacific Campaign (one battle star), American Theatre, and World War II Victory Medals. 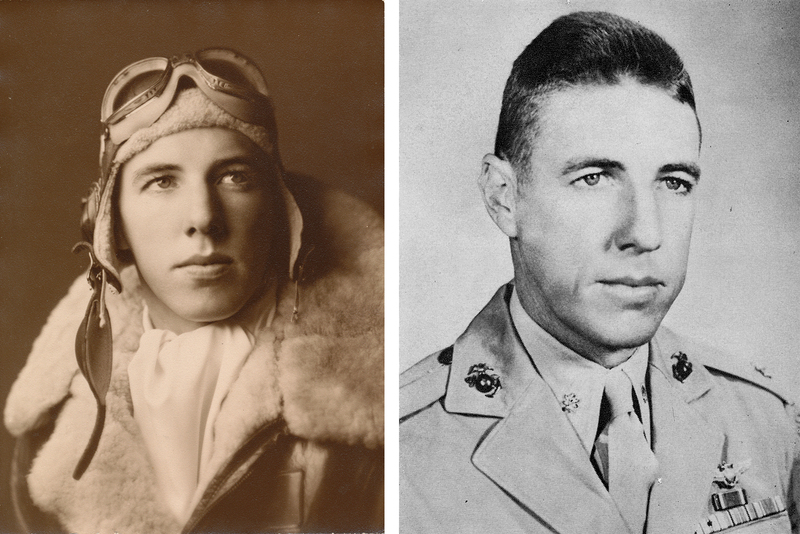 Frank F. Bell, III put in two thousand hours of wartime flying. Edwin Sharpe Bell (1923 – 1998), my father. In the service, he first reported to Camp Wolter, Mineral Wells, Texas. In July, 1943 he was transferred to Camp Abbot, Bend, Oregon for basic engineer training, being made Acting Corporal in August. Having qualified, he was sent to the Engineer Officer Candidate School, Fort Belvoir, Virginia, November 1943, with the rank of Corporal, graduating and receiving a commission as Second Lieutenant, Corps of Engineers, AUS, March 21, 1944. Before leaving, he completed the Topographical Supply and Map Distribution course there. On April 12, 1944, he was assigned to the 657th Engineer Topographic Battalion at Camp McCoy, Wisconsin, and served with this unit there and at Camp Campbell, Kentucky. After a six weeks’ course in the field production of terrain models at the US Navy Terrain Model School in New York City, he motor-convoyed to Fort Jackson, South Carolina, and on the 29th of December 1944 was assigned to the 12th Detachment Special Troops, Second Army. He then went to Indian Town Gap Military Reservation, Pennsylvania to depart from New York City on the ship Santa Rosa to Le Havre, France, thence to Liege, Belgium, to Muchengodbauck, Germany and rejoined the 657th Engineer Topographic Battalion with the 15th Army in Bad Neuenahr, Germany on May 6, 1945. After V-E Day, this battalion sailed from Marseilles, France in the ship Ocean Mail via Panama Canal-Eniwetak-Ulithe to Okinawa, arriving 6 October, then to Yokohama, Japan October 14. He was promoted to First Lieutenant October 26, 1945. In November, he was assigned to 3363rd Engineer Base Survey Company at Tokyo and moved with this unit to Seoul, Korea May 1946 and thence to Yung Dong Poe. He served as operations officer of the 3363rd, also personnel and supply officer. 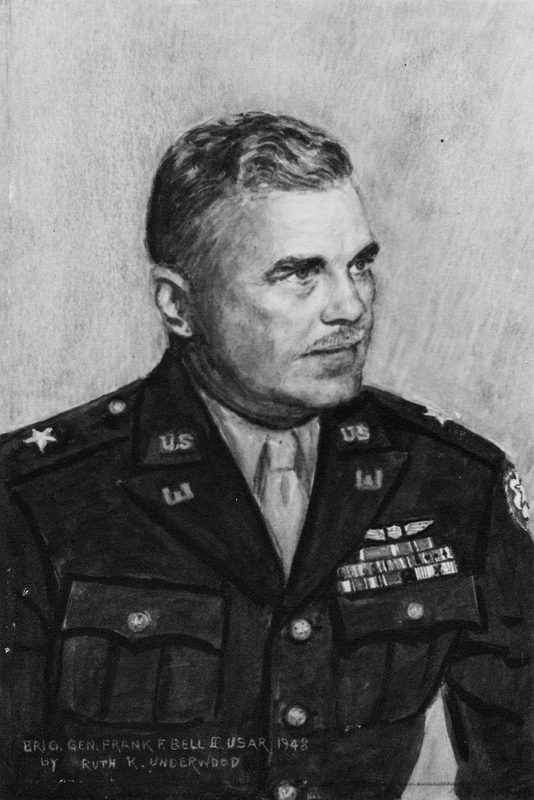 He then returned in the transport Phoenix to the United States at Fort Lewis, where he was placed on inactive duty as First Lieutenant, Corps of Engineers Reserve as of September 23, 1946. He holds the European-African-and Middle Eastern, the Asiatic-Pacific, and the American Theater Campaign Medals as well as the Army of Occupation Medal (Japan) and World War II Victory Medal. wow…this is quite an impressive assembly of military relatives. kudos to you for taking the time to do this…you have a lot to be proud of! thanks to your family for all they gave to support our many freedoms. I cannot tell you how excited I am to have found this blog! I have come across some old paperwork and there’s a letter from a Frank F Bell at Gerstner in La dated October 1918! How awesome to be able to see a photo of the man. Sounds like you have really worked hard in your research! Maybe this can help you? Email me for more info if you’d like. Dawnette, thanks so much for contacting me. Actually it was Frank, my grandfather, who did most of the research. And then his son, Ed (my father), brought this record up to date and corrected a lot of stuff in his last years. I will be continuing from where he left off, but first I need to dig myself out from under a giant pile of work. My grandfather, Frank, was a prodigious letter writer. In fact most men back in the early 1900s wrote much longer and florid letters than they do now. At least that’s what I discovered about my family when going through trunks in the attic after my mother’s passing last year. Nowadays, getting immediately to the point–the bottom line–is the preferred manly communication. You don’t know me, The Beutelspacher (Bidelpach / er) family that begann in Germany and now in other countries too, like USA and Mexico. We have common roots, I know the Bell’s history trough the Bidelspach/er family fromm Penn. I just came back from there , where i was invited to attend the yearly family reunion. Anyway to your knowledge there is a big Beutelspacher family in Mexico, we have a big genealogical chart who includes you. I already send this page to the Bidelspach and Bidelspacher family in Pennsylvania, they want to enter in contact with you and tne Bell family. Dr. Moises, sorry about not responding more quickly, my job is overwhelming right now. I’m very glad to know that there is another source for information about the Beutelspacher family. My grandfather had done most of the research on the original Beutelspacher family back in the 1960s, and no further research has been done since then. When my father decided to update the family history back in 1996, he concentrated on the newer generations and the branches that had been added through marriage. He passed away in 1998 and left me with all of the archives. Now that the internet has opened up gazillions of resources to research, I plan to continue with the process. But this won’t be for another 2 years. I will keep you in mind as a source of information. Eventually I’ll be publishing the family history online. In short – my great grandfather came from Germany and his father died at sea. He was placed in a German Society Family Home in Phildaelphia. He later became Judge Isaac Bidelspach of Northumberland County, Pennsylvania. My grandfather, Isaac, was a farmer in Point Township, Northumberland County, Pennsylvania. My father was Urias Samuel Bidelspach, salesman, served in USN, WWII, Recepient of various medals including the Silver Star. Seven campaigns in the south pacific. I have a son, John, who is a doctor and a daughter Janell. Janell has her masters and resides in Hollidaysburg, Pennsylvania. Barry, this is really cool that we’re able to connect so easily. More than likely, it was my grandfather, Frank Bell, who contacted your great aunt. And yes, he published a hard bound book of our family histories. Then my father hired a lady back in 1995-96 to continue the research. Most of their energy was concentrated on finding information about my mother’s family–Irish immigrants. I now have all the files. Sometime next year I plan to do my best to wrap my brains around this huge pile of paper. I’m assuming that the book of your family history is not the same as what my grandfather published. Is this correct? If so, we need to exchange. That is if you have a spare copy. I have one or two extras. My brother and I found about 30 copies in the attic when we were cleaning out our parents’ home after my mother’s death last year. Since all the Bell relations had their own copy, we kept only a few and tossed the rest. Don’t worry! That’s not a huge disaster since I plan on retyping (or paying someone to do it) the entire book in order to have a digital record that in turn will be combined with my father’s research and my future research into a new book. I’m a graphic designer and have gobs of experience in producing fancy printed publications. There’s also a wonderful group just north of Dallas that I would like to hand-bind the printed sheets into a custom hard-bound book. I also have all the family photos which I will be scanning and cleaning up. While doing this, the software that I use can transfer the material into an online version of the book. There is one big mystery that my grandfather and father could never solve: How did my great-great-grandfather (your great grandfather’s brother) end up with the name “Bell”? Lot’s of theories have been tossed around. One of them is that he had been brought into a family as an indentured servant and had eventually adopted their last name. Thanks for contacting me. The best way to contact me is through this website using the contact form or by leaving a comment like you did today. I’m in the process of moving my email to the same remote server where my websites reside. My current email is with a service that I have used since 1989. This service is pointless now that I have free email with my remote server. I believe the geneaolgy books are different. Yes, I have a copy. Apparently, the family connection was separated when my great grandfather died at sea on his way to America. His children were placed with the German Society in Philadelphia. Another ship followed my great grandfather with other family members. The captain of my great grandfather’s ship received various papers concerning the family. Passports, etc. The ship’s captain found the family members when they landed. Over the years, the papers were returned to my great grandfather and passed down in the family.. Our family name was Beutelspacher. Barry Bidelspach, I’m Grace Kern’s grandson. I have a family tree that she gave me last year( the year this conversation started), I was just wondering if you, or Dr.Moises Beutelspacher have made any more progress with the book. Patsy, I appreciate all the trouble you, aided by relatives, revealed genealogy research –and its relevance to Veterans day. I’ve heard from many the labor of love it is in exploring family roots. I think your efforts and articles are touching. An honor to your ancestors! My dad was an RAF pilot flying over the Himalayas (and other locations) in her Majesty’s airforce during WW2. He was a native Londoner and was raised in and lived in southern England even after losing his mother during the German Blitz when he was but 16/17 yr. old. I was really close to him and modeled myself after him in career and philosophy as much as and more than other of my mentors. I lost him last year (as I think you heard); and to honor him attended a memorial to the British pilots squadrons, held annually now, in Terrel TX. (a growing parade/recognition now spreading worldwide), for Europeans trained in America but serving primarily back in Europe), the Texas base which was one of the largest training sites in the U.S. for the RAF(Royal Airforce) pilots. I’ve got a photo taken last summer when I accepted a plaque in his honor. I’d love to share with you sometime. Thank you so much, Pamela! All of the allied veterans should be honored today. Your dad must have been so young when he joined the RAF and mad as heck to lose his mom to the German bombs. I didn’t know that Europeans trained here in Texas. If your photo from last summer isn’t digital, I hope you can get scanned and share it with us on facebook.